We’ve got five, very colorful, new residents! We welcome two male Pekin robins from the Toledo Zoo, born in March 2012 to the same clutch, and two female Pekin robins, from the North Carolina Zoological Park – one female was born in September 2011 and the other in April 2012. All have already formed into two, separate male/female bonded pairs, which leaves keepers hopeful for future breeding possibilities. They’re very active on exhibit often seen foraging on the ground for food, so they should be easy to spot. Pekin robins are known for their singing; in fact, the male sings very complex songs with many syllables to attract the female. 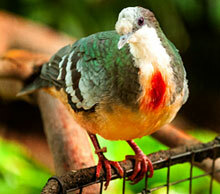 We also welcome one male Luzon bleeding-heart dove from the Toledo Zoo, born August 2012. Luzon bleeding-heart doves don’t perch or fly a lot and spend more time on the ground. Be patient if you don’t see him right away on exhibit – he’s still a bit shy as he adjusts to his new home. We hope to find a mate for him soon. When Luzon bleeding-heart doves nest, the male and female share equal time incubating the eggs, switching positions like clockwork. 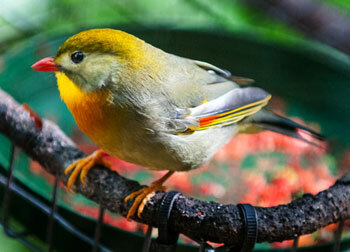 Visit all five new arrivals daily, at the Herb and Nada Mahler Family Aviary.